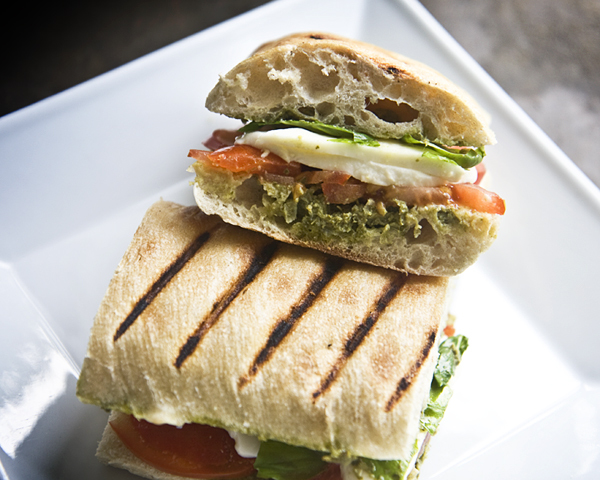 Here’s a sandwich that’s a riff on my favorite Italian street food, the delicious and simple caprese panini with pesto! Slice the Ciabatta in half lengthwise. Spread both inside halves with pesto. Arrange the tomato slices in a single layer on the bottom half of the bread, then sprinkle it with salt, add the mozzarella slices, top it with torn basil leaves, and finally, the top bread. If you have a panini press, go for it! I don’t have a panini press, and I don’t want one. Instead, I heat my cast iron grill pan, place the sandwich in the grill pan, then use a Le Creuset casserole lid to weigh it down. I grill the sandwich for 3-4 minutes, then flip it and grill it for another 3-4 minutes, or until the cheese starts to melt. Panini in Italy are toasted, but not really warm and gooey in the center like an American grilled sandwich; to keep it authentic, don’t go for a full melt. Oh this sounds so good! If I had all the ingredients I would so make this right now!! Time to get down to the store and then fire up the grill! Thankyou! !